This is the Army - starring Ronald Reagan. Home - Feature Length - This is the Army, starring Ronald Reagan. This is the Army, starring Ronald Reagan. Watch one of our great former Presidents in his former life. 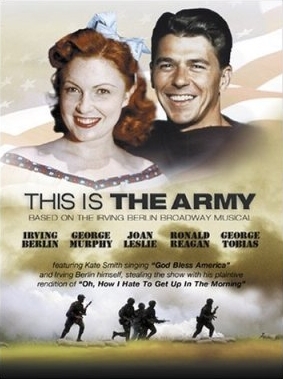 Ronald Reagan stars in this musical about the Army in World War I. A stunning time capsule of the former President. In World War I, the musical Yip Yip Yaphank is a rousing success. During the show, it is learned that the troop has received its orders to ship off to France, and thus the end number is changed so that the soldiers march through the theater with their rifles and gear and out into the waiting convoy of trucks. Jones kisses his new bride on the way down the aisle. In the war, several of the soldiers in the production are killed. Jones is injured by a bomb blast and loses the full use of one of his legs, ending his career as a dancer. Nevertheless he is resolved to find something useful to do. Sgt. McKee and the bugler also survive. Twenty-five years later, with World War II raging in Europe, Jones' son Johnny is drafted into the war. He tells his sweetheart that they cannot marry until he returns, since he doesn't want to make her a widow. He grudgingly accepts the order to stage another musical, just as his father did. The show goes on tour around the United States and eventually plays in front of President Roosevelt (unseen) in Washington, D.C.. During the show, it is announced that the Washington, D.C. performance will be the last night, and that afterwards the soldiers in the production will be ordered back to their combat units. Johnny's erstwhile fiancé, who has since joined the Red Cross auxiliary, appears at the show. During a break in the show, she brings a minister and convinces them that they should marry - which they do, in the alley behind the theater, with their fathers as witnesses. Cast: Ronald Reagan, George Murphy, Joan Leslie, George Tobias, Alan Hale, Charles Butterworth, Dolores Costello, Una Merkel, Stanley Ridges, Rosemary DeCamp, Ruth Donnelly, Dorothy Peterson, Frances Langford, Gertrude Niesen, Kate Smith. Run Time: 1 hour, 54 minutes.